DEMO INTERNATIONAL® Heads to the Nation’s Capital! The Canadian Woodlands Forum’s DEMO International® will be held outside the Ottawa/Gatineau area, Canada, on September 24-26, 2020. Showcase your product LIVE and IN ACTION to the thousands of visitors who will attend the show from around the world! SBC Cedar (SBC) with sawmills in Quebec and New Brunswick will host the event on one of their properties in Venosta, Quebec, located within a forty-five minute drive north along the Gatineau River. 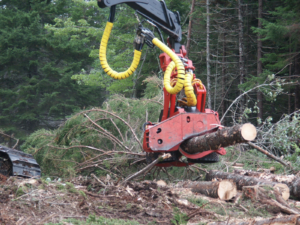 Anything and everything to do with forestry operations, and the equipment that is needed to make operations run more efficiently, will be found at DEMO International® 2020. 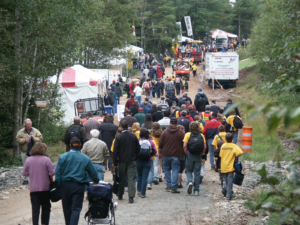 Every four years, thousands of industry professionals attend DEMO International® to make big decisions for their foresty-based business. RESERVE YOUR SPACE IN THE FOREST TODAY! 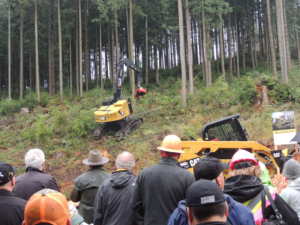 Live demonstration of woodlands equipment, including all types of forest harvesting, commercial thinning and chipping. Includes a roadside landing of 150m2 (10m x 15m) and a minimum of 1 hectare of forest area to demonstrate equipment. For safety reasons, active truck transport will not be permitted. Passive exhibit, with the option to operate in place, and no additional materials required. Examples include: portable sawmills; tire suppliers; GPS equipment; truck and trailers; safety equipment; hydraulic hoses; fuels and lubricants etc. Roadside landings are 10m x 10m (100m2). These booths will include a 10’ x 10’ tent/shelter. These booths will be grouped together (6-8) and placed along the loop. Each active exhibitor will be provided a landing of 150m2 (10m x 15m), plus 1-1.5 hectares of site area to demonstrate wood harvesting equipment. Site area will vary to accommodate topography/environmental constraints. Static exhibitors and booths will be provided with a landing of 100m2 (10m x 10m), upon which tents and equipment can be stationed. Landing dimensions may vary slightly to accommodate building constraints. Organizers reserve the right to group exhibitors to make full use of landing space. Canadian Woodlands Forum Members who have been a CWF member for at least four consecutive years prior to the Demo International® 2020 show at the time their space is contracted will receive a 15%* discount on the pricing listed above. *This discount will be calculated upon the final payment. Reservations: contact hotel for booking or contact cn325.agm@innvesthotels.com. Quote DEMO International ® room block. Reservations: contact the hotel directly 1-866-214-1239 and quote block Canadian Woodlands Forum Sept 24, 2020. Reservations: 1 888-627-8089 and provide the group code DE2179, OR click the following link to Book your group rate for DEMO International. Reservations: contact reservationcrowneplaza@rosdevhotels.com or by calling 819-778-3880 or 1-800-567-1962. Quote DEMO International ® room block.